If you are interested in growing a garden, there are lots of people offering advice from the internet, to books to even those you know very well. However, not all advice is good advice and some is just downright silly. Sorting out the good from the bad is sometimes difficult, especially if you are a novice gardener. So, not matter where you get your gardening advice from, it is a good idea to be sure that your source is reputable and that there is truth behind the claim. Some gardening tips of old have now been proven wrong in light of new discoveries. Let’s look into some of these gardening myths that should be discarded in the light of new findings. Pruning cuts painted over with tar or pruning paint may give the impression that the tree is well looked after. Latex, shellac, petroleum and asphalt compounds are some of the materials used for wound dressing. The idea is to seal off the cut surfaces to prevent rot and other diseases. However, new research finds that wound dressings of this sort do not benefit trees and that, in most cases, they may be quite harmful. When any part of the stem is damaged or cut, trees use their self-healing mechanisms to form a scar tissue or callus at the site of the injury. This helps keep out pathogens that may otherwise infect the trees. Wound paints prevent the formation of calluses, thus interfering with this natural healing mechanism. They can actually seal in water along with spores and microorganisms that cause decay. Bleeding cuts, in particular, should never be dressed in any way. The practice of wound dressing probably originated in places where it rains frequently, the extra moisture inviting fungal infections. Elsewhere, fungicides and insecticides may be applied on the cuts in specific cases when trees like cherries and plums are at risk of developing silver leaf disease or oaks are under the threat of oak wilt, a fungal disease spread by insects. It is better to make the cut as clean as possible using a sharp instrument. 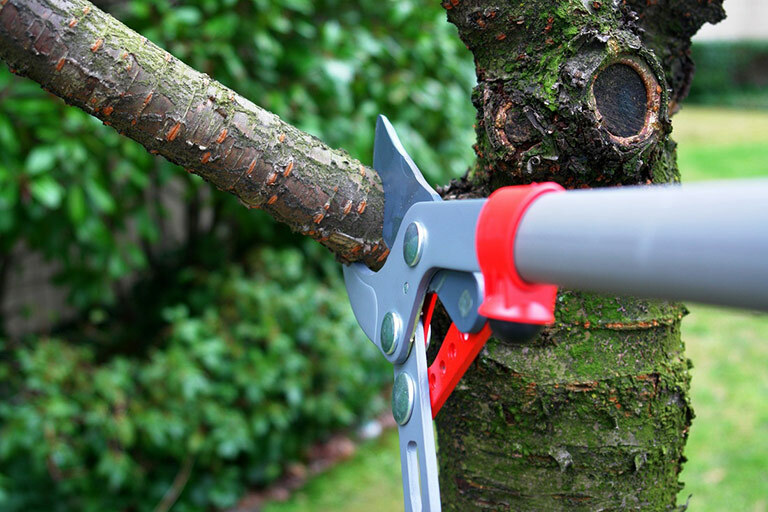 Sterilize the saw/pruning shears and make a slanting cut close to the collar of the branch. Then, leave it to the tree to do the rest. Do heavy pruning towards the latter part of winter when the trees are at minimum risk of infections. We hear a lot about the detrimental effects of chemical pesticides; so by contrast, organic pesticides may appear to be safe. Organic compounds derived from plants and animals may be more biodegradable than man-made chemicals, but it is just so wrong to think that they are all harmless to people or the environment. Some of the most poisonous substances on earth are derived from plants and animals, typical examples being snake venom, ricin derived from castor plant and botulinum toxins produced by bacteria. Several organic pesticides are used in agriculture; they have varying amounts of toxicity. For example, Rotenone extracted from the roots of certain tropical bean plants is a very potent pesticide, insecticide, and piscicide, all rolled into one. Despite being organic in origin, it has been found to be six times more toxic to humans and other animals than Sevin, a chemical pesticide of similar action. Rotenone is banned in some countries but continues to be used liberally in others. 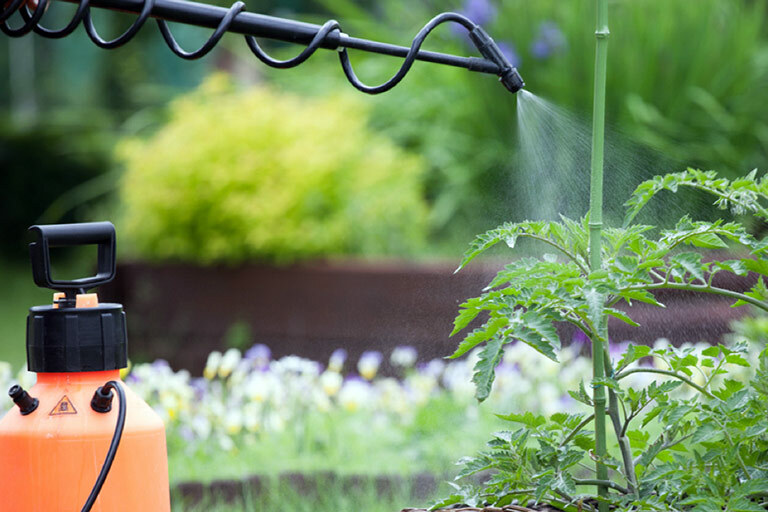 Nicotine, pyrethrum, and neem are some of the other plant-derived pesticides used by gardeners. Nicotine has high toxicity for mammals, including humans; pyrethrum has immediate action on pests while being less toxic to mammals. Neem, which has a slow action and disrupts the metabolic pathways of insects, may be safe for other animals. Bacterial toxins such as Bacillus thuringiensis (Bt) toxin and Alpha Beta Protein are used to trigger defense mechanisms in crops. They induce the crops to produce biochemicals that make them more resistant to potential pathogens. The safety of these toxins, as well as that of the additional substances that plants produce against them, is under the scanner. So, organic pesticides should be chosen carefully for their merits rather than their ‘organic’ label. And, they should be used with the same caution that you reserve for chemical fertilizers. Clay holds on to water; sand quickly drains. So, when you’re told to add sand to clayey soil, it seems quite logical. But what actually happens is that you get more compacted soil that defies tilling, let alone better drainage. Imagine what would happen if you poured sand into a tin of marbles. The sand will pack into the spaces between the marbles, making it difficult for both the sand and the marbles to move about. The same way, the fine clay particles fill the spaces between the larger sand particles, giving a thick, mortar-like consistency when mixed with water. The best way to amend clayey soil is adding plenty of compost and leaf mold. These light materials get clay particles to stick all over them, but resist compaction. It gives the soil an airy structure that facilitates better drainage. Once amended with compost, adding sand may have some additional benefit. No gardener toiling out in the garden may have escaped this myth. Well-meaning fellow gardeners everywhere would warn you that you will end up killing your plants if you water them at noon. The explanation given is that the water droplets act as lenses concentrating sun’s rays onto the leaves. Anyway, if this myth were true, mid-day downpours would have caused widespread devastation in large fields. That doesn’t seem to be the case. 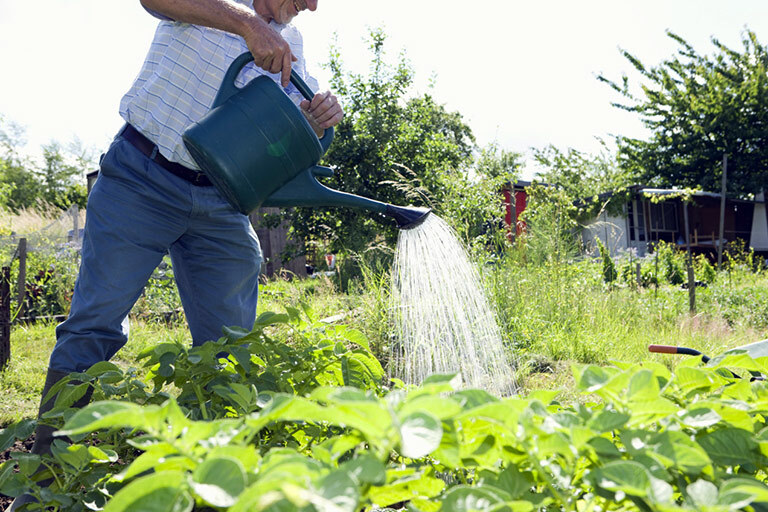 As a matter of fact, many gardeners find it beneficial to spray their plants when they look tired in the hot sun. If at all burn spots develop on leaves after you watered your garden, it’s a good idea to check your water for soluble salt concentration. When the water droplets evaporate, the caustic salts deposited on the leaves may cause burn spots. When tree saplings are transplanted, gardeners are anxious that they should get a good foothold in the new location. After all, they are to face fierce windstorms and other vagaries of nature as they grow. The advice to dig a deep hole, at least twice the height of the root ball, is often followed with religious fervor, and if the tree were to succumb to a thunderstorm several years later, you can guess where the blame would fly. Now it turns out that deep holes are not what give stability to the trees, but wider ones. 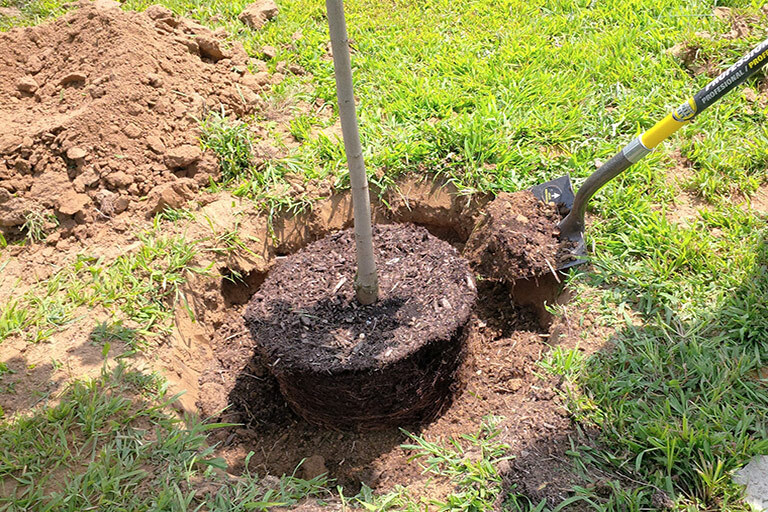 The planting hole should be ideally twice the diameter of the root ball, if not more. This provides a large area of loose soil for the roots to spread out. A wider base would obviously anchor a top heavy tree better than a narrow one. 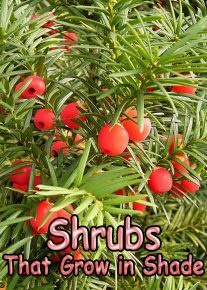 This myth probably comes from every gardener’s desire to provide every help possible to help a new plant. 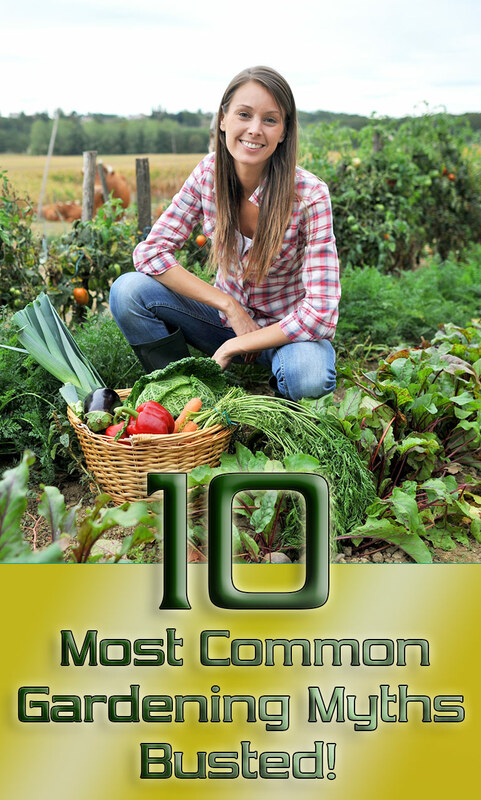 Compost-rich soil is a great growing medium, and fertilizers can make plants flourish. But planting time is not the best time to provide these. When you fill a planting hole with compost, you are giving the plant a relatively loose medium rich in nutrients. It also absorbs moisture well. The plant will restrict its roots to this area since it has no need to spread them out to the harder and drier soil beyond the planting hole. For one thing, it affects the stability of the plant. Another problem crops up when the watering is eventually reduced. The fast-draining compost dries up quicker, leaving a dry zone around the plant. With not enough roots beyond this area, the plant suffers. 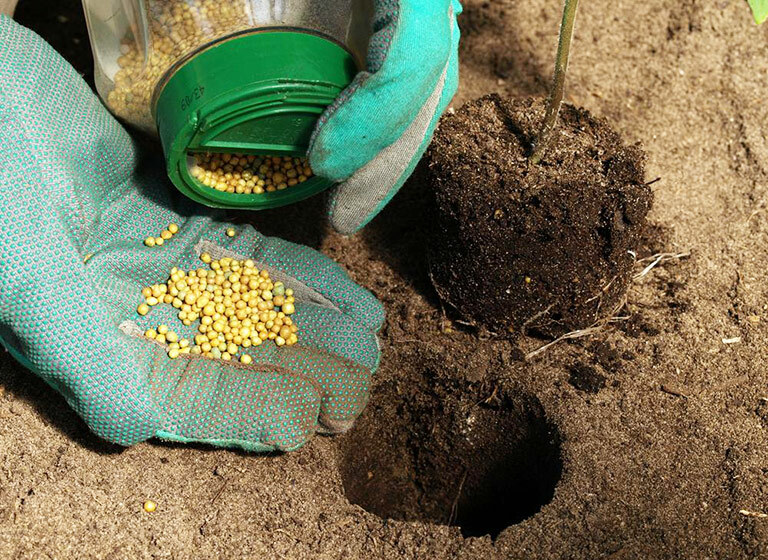 When it comes to fertilizers, high concentrations can burn the roots, especially the new roots the plants need to put out to establish itself. Root burn is a common reason for new plants not thriving despite all your attention. After keeping the new plant in position, backfill the planting hole with the same soil you dug up. Water well. Allow the plants to spread out its roots in search of nutrients first, and then apply compost and fertilizers around the plant, but never too close to the stem. Some gardeners dig a shallow ditch around the plants for adding compost, but that is not necessary. Just cover the compost with a thick layer of mulch. 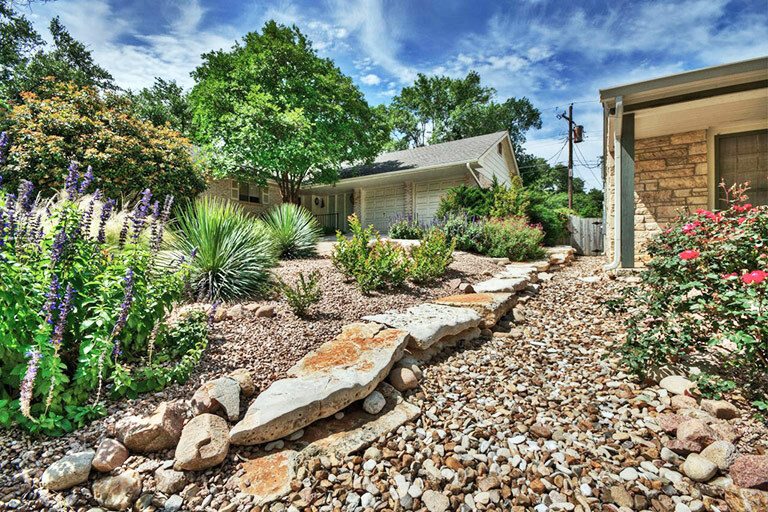 People turn to xeriscaping for many reasons. While some gardeners are forced to grow drought-resistant plants due to water scarcity or watering restrictions, others are enamored by the aesthetic appeal of a desert land or ease of maintenance. 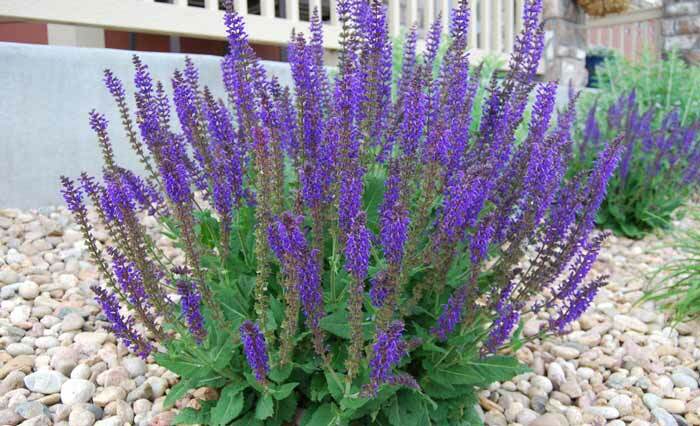 Whatever your reason, it is a myth that drought-tolerant plants don’t need to be watered. Plants native to arid lands are generally recommended for xeriscaping, but they do need quite a bit of water in the first year. Lavender, Agastache, Salvias, Yarrow, Sage, Blue-eyed grass, Red hot poker plant, Armeria, Black-eyed Susan are all drought-resistant once established but don’t expect them to be drought-proof. They do need regular watering and an occasional drink in summer. Even desert areas get occasional rains. Some plants like cacti and succulents have tissues that store water, so they may be able to survive dry periods without much damage. Grasses that dry up in the summer heat may turn green again when rains come. But if you neglect thin-leaved flowering plants, they may not make it through the summer. That said, one thing common to drought-tolerant plants is that they hate water logging. Plant them in well-draining soil. This myth is based on the fact that some fruit trees need cross-pollination to bear fruit. In any flowering plant, the pollen from the male anthers should reach the female parts the flower for fertilization to take place. The ovary then develops into fruit. Self-fertilization can take place if male and female parts are present in the same flower or in different flowers on the same tree. However, there are exceptions. Not all trees self-pollinate even when there are male parts in the same flower or male flowers in the same tree. They are self-sterile. For example, some apples, plums, pears and sweet cherry need pollen from other trees for fertilization to take place. Honey bees are the main pollinators of fruit trees. That means you need more than one apple tree or sweet cherry in your own garden or in neighboring gardens for the bees to bring in the pollen. Just getting two of the same type of tree may not work out here. They have to flower at the same time and be compatible in other ways too. Experienced gardeners know which varieties are compatible. 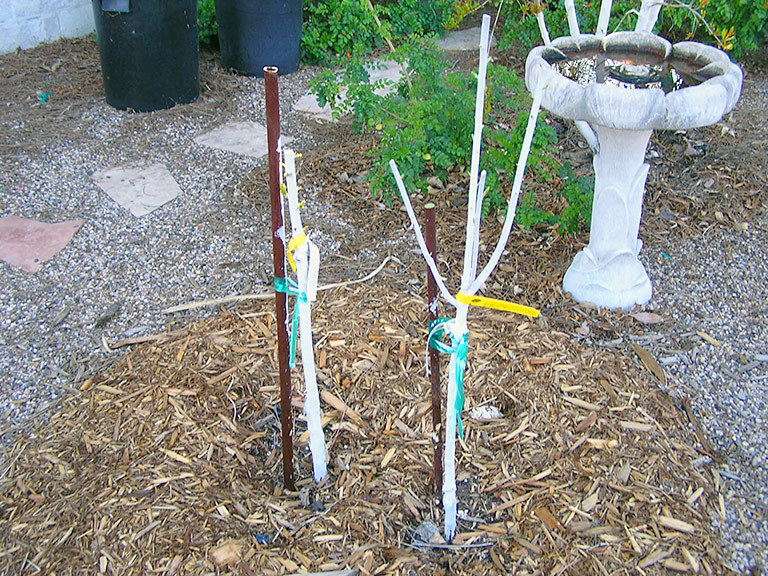 If you are purchasing a self-sterile apple tree, you need to know exactly which other variety you should buy along with it. Better still, go for a self-pollinating variety. There are plenty of such varieties around, including Granny Smith and Golden delicious. You may not be so lucky with sweet cherries and apricot, though. Some trees like persimmons have separate male and female trees, but again, there’s no point in buying two. You have no guarantee that you will get a male and a female unless you get grafted trees. When you find a plant declining, or not thriving, the first instinct is to feed it with fertilizers. 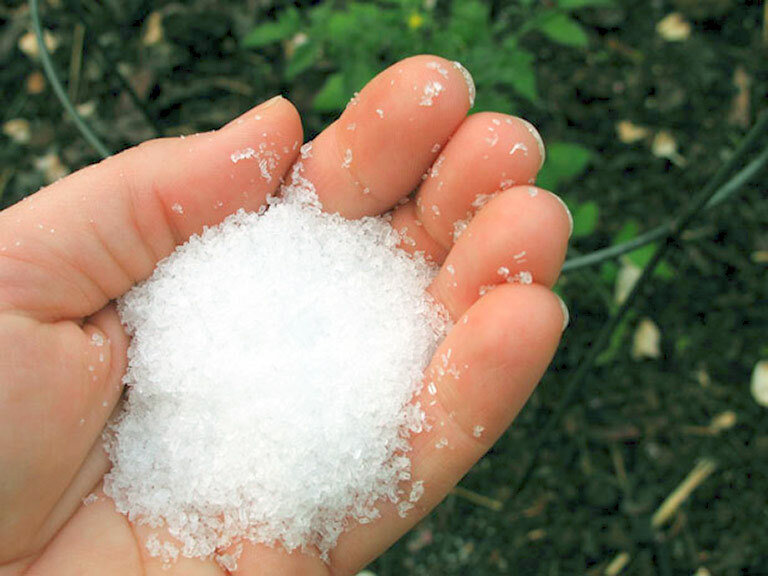 This comes from the mistaken belief that fertilizers are food for the plants, as the very term ‘feeding’ indicates. We often forget that plants can make their own food, and all they need are sunlight, air, and water. Millions of acres of woods and meadows manage without our intervention. 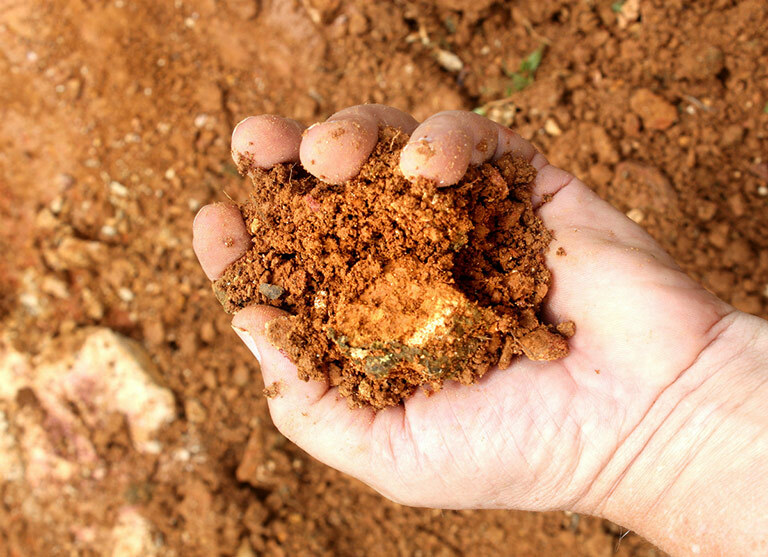 Plants may use up certain minerals in the soil for their metabolic activities, resulting in their gradual depletion. 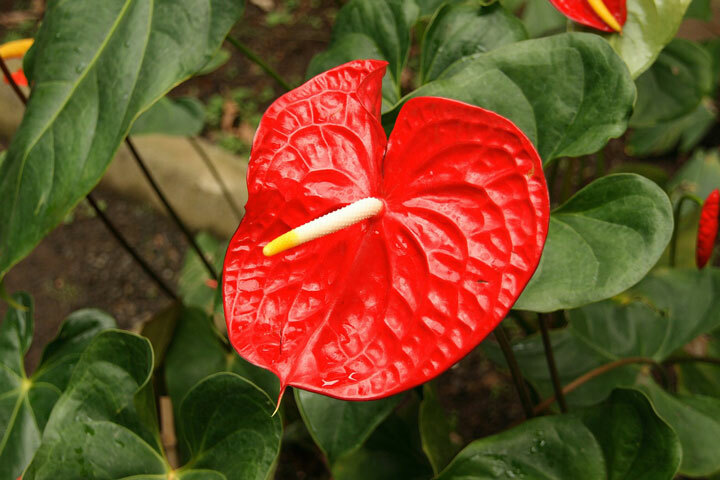 When these minerals are provided through fertilizers, the plants often respond with renewed vigor and vitality. But that doesn’t mean every plant can be revived with additional feeding. The first step is to find out the actual reason for the decline. Some common causes include insect attacks, diseases, environmental stress, adverse weather, damage to roots and root girdling. Both inadequate water and excess water can be detrimental, especially if the area has drainage issues. Rule out these, and other probable causes, before giving the plants a liberal dose of fertilizer. Excess fertilizers can even kill a tree that is already under stress. You can use sugar to sweeten sliced tomatoes and baking soda can make the soil temporarily alkaline, which is referred to as sweet soil as opposed to acidic/sour soil. Unfortunately, changing the sweetness of tomatoes is not so straightforward. 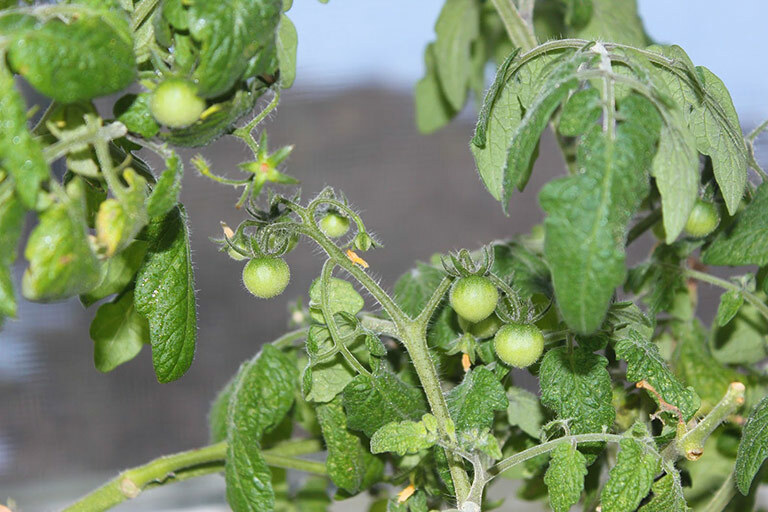 The tomato variety and the amount of sun exposure may have some bearing on the taste and flavor of tomatoes, but soil pH does not seem to affect sweetness. If you want sweeter tomatoes, go for cherry tomatoes or specific varieties known for their sweet taste. By the way, tomatoes prefer a pH range of 6 – 6.8, which is slightly on the acidic side. So refrain from adding baking soda to your tomato beds unless you have acidic soil.